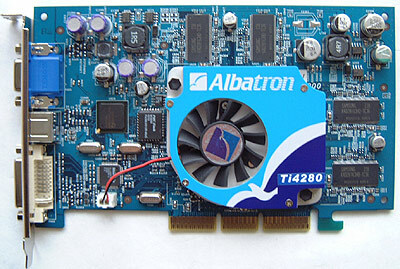 The Ti4280PV is Albatron's mainstream Ti4200 w/8x AGP videocard, using the all familiar 6 layer PCB, and 128MB of Samsung 3.6ns TSOP-II memory. The memory only gets peripheral cooling from the exhaust air that leaves the GPU cooler, as there are no ramsinks included. Since the reference Ti4200 comes in much the same fashion I wouldn't be worrying at all about the lack of memory heatsinks either. If you want to do some video work with your computer, the Albatron Ti4280PV is fully VIVO capable which is quite handy. Albatron include two older games with their card (Serious Sam and Motocross Racer), but perhaps it's time for them to bundle something newer. 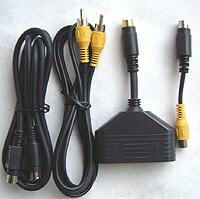 Because all GeForce4 cards support nView, we also would have liked to have seen Albatron include a DVI to analog converter so users have the option of using two CRT monitors. The Albatron GeForce4 Ti4280PV is the most expensive card in the roundup, but that's mainly due to it being fully VIVO compatible. In terms of overclocking, we weren't expecting much from the Albatron Ti4280PV. After all, it doesn't come with a big fancy copper GPU cooler... and hey, if a video card doesn't have a copper heatsink it must not be good at overclocking right? WRONG! Like many things in life, looks can be very deceiving! The memory met us with average overclocking success, topping out at a very respectable 594 MHz with no artifacts. It was the Ti4280 core which really surprised us with its results. Using the stock reference cooler, we were able to bring that bad boy up to an amazing 325 MHz core speed! That's 12 MHz higher then the next closest contender, and goes to show you that a big heatsink does not guarantee you're going to get a good core overclock.